Spring is slowly (excruciatingly slowly) trying to establish its presence here in the Great White North. The snow is mostly gone save for the continually shaded spots, the robins are back much to the lament of terrified worms, the squirrels are once again running wild around the backyard, and in households across the country attention has started turning to the sacred tradition of preparing protein sources over open flame. Ah, yes, the first BBQ of the year. A day long anticipated and well earned after months of winter spent eating from the oven. And considering the weather we’ve had this winter, this could be the only BBQ day all year so best to get the grill cookin’ while the sun is shining and temps are well into double digits. What is it that makes grilled meat just that much better tasting than broiled, baked, fried, or (god help us) micro-waved? Perhaps it’s the anticipation, particularly for us Canucks, as months pass without the convenient climate characteristics conducive to cooking on the que. Waiting makes everything better or so the girls I went to high school with forced had me believe. Or maybe there is a proven scientific answer that some currently unemployed grad student established and published with much fanfare in The Journal of Omnivorous Carnivorology. Whatever the reason, I savour the day when Mother Nature finally allows me to prepare a meal the way our ancient ancestors first conceived a cooked meal. This year I decided to jump right in with something a little more elaborate than burgers. Not to say that burgers are boring or unworthy of kicking off a BBQ season, but sometimes I find it liberating to make something a little fancier and jolt my dormant taste buds into action after a long off season. Not unlike skipping the beer and going straight to the rye. 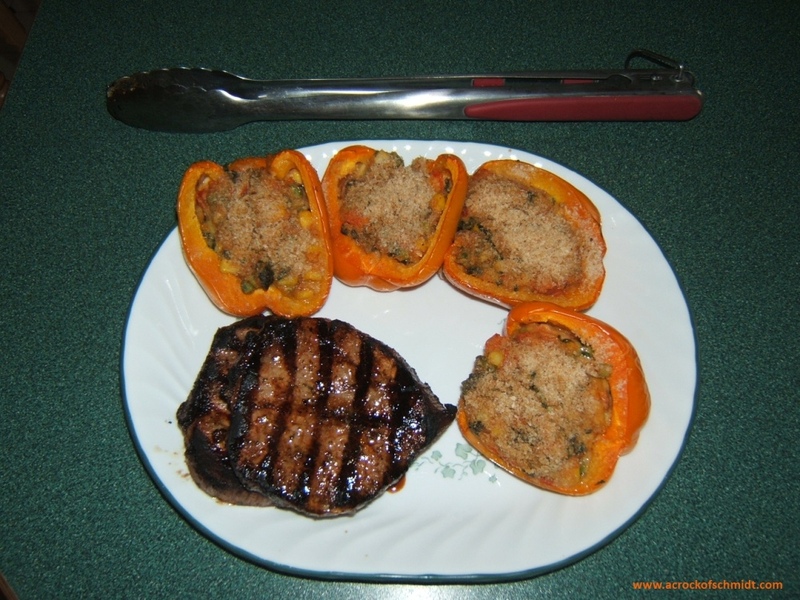 And so my choice for 2014’s inaugural barbequed supper was marinated top sirloin steaks and stuffed bell peppers. The steaks were marinated overnight using my mother-in-law’s top secret marinade recipe. I say it is top secret because I haven’t a clue where it came from. For all I know it could be a family treasure from the old country or it could be swiped from a Betty Crocker 1955 cook book. Regardless, it is delicious. The stuffed peppers recipe I found on the Food Network website a few years ago and it’s one I come back to year after year when I wish to impress summer guests or entice the wife to reward me. I follow the recipe fairly truthfully though I cook the peppers in a very hot BBQ over a turned off burner. The peppers burn easily so it’s best not to have any flame directly below them. Slow cooking in this manner for about 20 to 30 minutes should do it. This batch I added some frozen peas since I had less frozen corn than I realized. I’m sure tweaking in this manner would work for several types of veggies should you wish to experiment. When all is said and done, a scrumptious and quite healthy meal awaits your salivating mouth. And with that another BBQ season is under way. Enjoy.